It was one week ago today that the word "evil" began to be used in media coverage and political discourse without appearing to be an exaggeration or hyperbole because it was not. 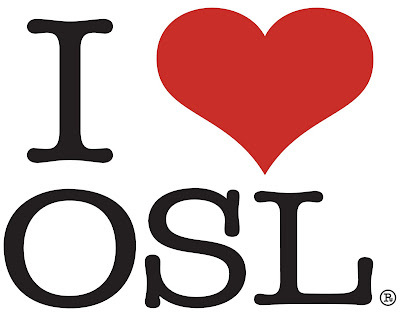 The July 22, 2011 terror attacks that claimed at least 77 lives and injured at least another 96 in downtown Oslo and the nearby island Utøya where Labor Party youth were gathered.The bulk of the deaths where children and adolescents on the island. The first funerals were held today in Oslo for the 77 killed in the July 22nd attacks. Then the following Monday, July 25, 2011 the people of Norway demonstrated their profound rejection and defiance of terrorism embracing courage and love marched through the streets of Norway with roses held high in their hands in remembrance of those who had been killed. It came to be known as The Rose March. 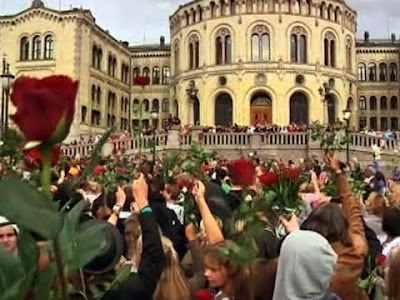 Tomorrow Saturday, July 30 at 2:00pm rain or shine I will join together with other people of good will, be it 2 or 3 of us to deposit red and white roses at the Torch of Friendship in remembrance of those killed on July 22nd in Norway and in solidarity with the good people of Norway who took to the streets in defiance of the fear that terror seeks to impose. The song in the videos above Til Ungdommen ( in English: To our youth) before being set to music was first a poem published in 1936 by a Norwegian poet and writer who died fighting the Nazis during WWII. increase it and strengthen it! War is contempt for life. wring answers out of it. 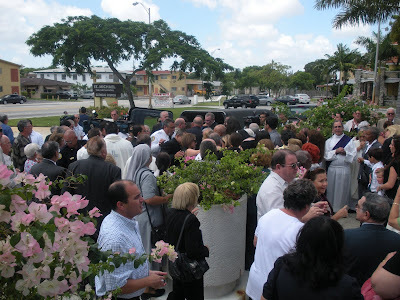 Member of the Felix Varela Foundation at Our Lady of Charity speaks of the importance and legacy of Monsignor Pedro Meurice Estiú. 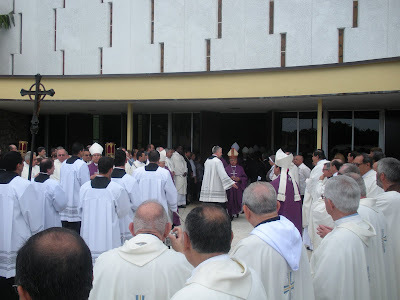 Archbishop Thomas Wensky addresses Resurrection Mass for Monsignor Pedro Meurice Estiú. 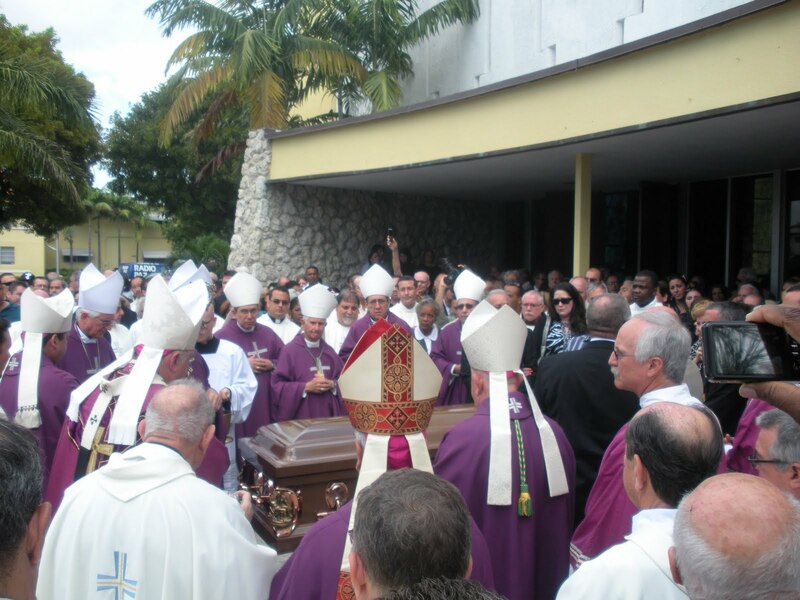 Cuban priests sang the Cuban national anthem at the end of the service at St. Michael Church. Rest in peace Father Pedro Meurice Estiú and please pray for us sinners on both sides of the Florida Straits. 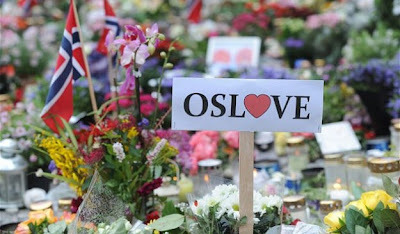 July 22, 2011 Terrorist attacks in Oslo and on Utøya island claim 76 lives with 96 injured. 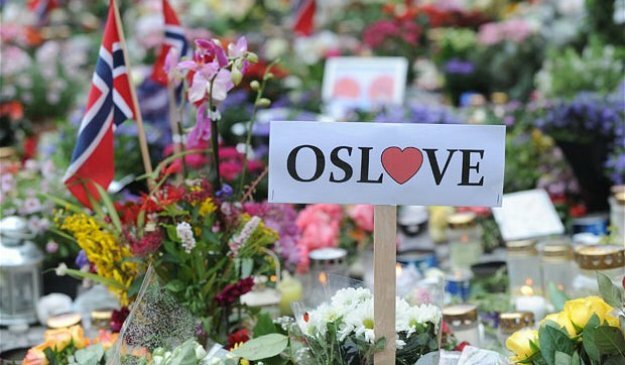 On Friday July 22, 2011 Norway suffered two brutal terror attacks that claimed at least 76 lives and injured at least another 96 in downtown Oslo and a nearby island Utøya where Labor Party youth were gathered. Today in Cuba is a public holiday that is celebrated with parades and speeches. On this day in 1953 a group of armed men organized by Fidel Castro led an assault on the Moncada barracks in Cuba. It was a disaster most of the men were killed and the rest captured. Fidel Castro went on trial and used it to spread his propaganda and later become a national figure in Cuba. During the revolutionary struggle between 1953 through 1959 acts of terrorism and bombing were common in Cuba. Following the Castro regime's consolidation of power state terrorism became a part of the revolutionary government's policy. The adjectives this terrorist used in describing Castro condemn but the quote is part of what inspired this mass murderer to action. What is troubling is that this Castro quote is presented in popular literature as an inspirational message. Fidel Castro has also been involved in ordering at least one premeditated attack that on July 13, 1994 led to the deaths of 10 children and 18 youth along with 9 adults in the "13 de Marzo" sinking that totaled 37 dead. 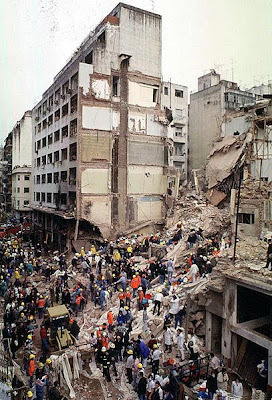 On July 18, 1994 a bomb exploded and destroyed 7-story Jewish-Argentine Mutual Association (AMIA) community centre in Buenos Aires killing 85 men, women and children. This terrorist attack was linked to Iran but the individuals responsible have yet to be prosecuted. And according the Marxist terrorist and mass-murderer Che Guevara; half of the people he sent to manufacture explosives blew themselves up (probably due to them using lacking instructions, ignoring precautions and using open flames. But much the same can be said about Osama bin Laden, Ayman al-Zawahiri, and many other Islamist activists. Bin Laden was a businessman and engineer, and Zawahiri was a medical doctor; neither were theologians or clergy. Their writings show that they were much more interested in Islamic history than theology or scripture, and imagined themselves as re-creating glorious moments in Islamic history in their own imagined wars. Tellingly, Breivik writes of al Qaeda with admiration, as if he would love to create a Christian version of their religious cadre. It is not only the Norwegian bomber that has expressed admiration for Osama Bin Laden but also admirers of Che Guevara that have profiled the Al Qaeda leader as a revolutionary leader in the Argentine website Che Guevara.com . According to Irish writer Eilis O'Hanlon the bloody legacy of Che Guevara is still having an impact around the world for example in September of 2009 in Ireland a 600 pound bomb was diffused twice as large as the one that claimed 29 lives there a decade earlier. In addition to Bin Laden, Castro and Guevara, the Norwegian terrorist while denying he is a Nazi extensively quotes and mentions Adolph Hitler throughout his 1,500 page rant. There are no links to the manifesto on this page because there is no desire to promote it because it doesn't offer answers as to why. At its root terrorism, whether carried out by individuals or a state, is an evil act. This requires taking a look at the inner workings of a human being. C.S. Lewis in his 1952 book Mere Christianity made the following observation: “Whenever we find that our religious life is making us feel that we are good - above all, that we are better than someone else - I think we may be sure that we are being acted on, not by God, but by the devil. ...“For Pride is spiritual cancer: it eats up the very possibility of love, or contentment, or even common sense.” One could add that it would also apply to those who have replaced a religious life with a secular/ideological substitute. Swiss psychiatrist Carl Jung observed in the video below that "the only real danger that exists is man himself, he is the great danger....We are the origin of all coming evil." Another and related perspective on the nature of evil is offered by the late American psychiatrist Morgan Scott Peck who wrote People of the Lie: The hope for healing human evil and in the 1983 video is interviewed about the book on PBS in the program The Open Mind. During the interview he states that "Evil is an anti-life force and if we start going out to kill it, exterminate it we then become contaminated by it because we become killers." Peck characterizes evil as a malignant type of self-righteousness which results in a projection of evil onto selected specific innocent victims (often children or other people in relatively powerless positions). Peck considers those he calls evil to be attempting to escape and hide from their own conscience (through self deception) and views this as being quite distinct from the apparent absence of conscience evident in sociopaths. He also considers certain institutions may be evil, as his discussion of the My Lai Massacre and its attempted cover up illustrate. By this definition, acts of criminal and state terrorism would also be considered evil. In the end the man that called others terrorists and mass-murderers apparently as a critique became one himself and as M. Scott Peck would say crossed the line and slid into evil. There is a way to fight evil and that is to be able to spot it in yourself and struggle against it to be a better person and externally use nonviolence to combat it. Mohandas Gandhi issues a challenge when he says that "Nonviolence does not signify that man must not fight against the enemy, and by enemy is meant the evil which men do, not the human beings themselves." Norwegians demonstrated how to fight this enemy with their silent Rose March and rejection of hatred. 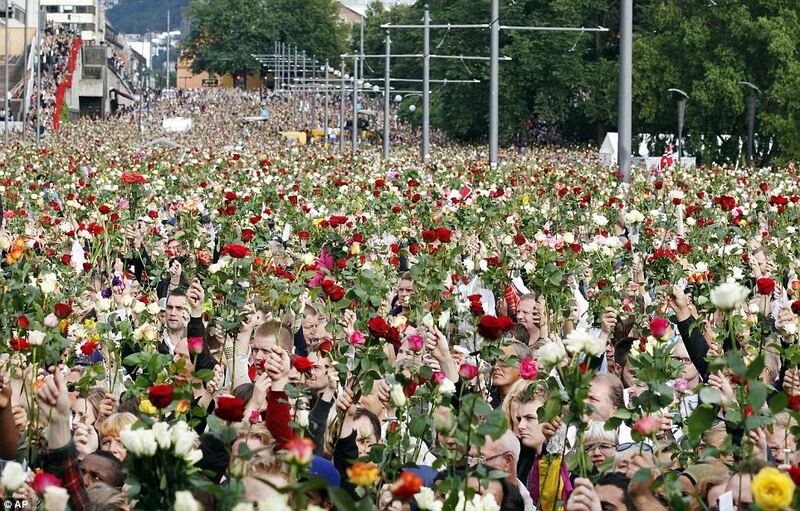 More than a 100,00 rallied today to express grief and unity for the victims of terror attacks in Oslo and Utøya that took place on Friday, July 22, 2011. Some reports place the number of participants at 150,000 alone in Oslo. Poignant videos have appeared on youtube with images and music such as Norwegian musician Maria Mena's Mitt lille land and she is also offering the song as a free download. The Canberra Times reported that the Norwegian Prime Minister addressed the evening crowd, many holding up the red and white roses for remembrance: "By taking part you are saying a resounding 'yes' to democracy." He called the Rose March a "march for democracy, a march for tolerance, a march for unity. Evil can kill a person but never conquer a people." The BBC reported that Crown Prince Haakon told more than 100,000 people in Oslo that "tonight the streets are filled with love". Norway has demonstrated once again the courage and decency of its people in confronting terror with defiance and dignity in this silent protest against hatred and terror. Writing from Miami, Florida a long ways from the streets of Oslo can only say that I was present in spirit and pray and offer my condolences for those who have died, were injured and their loved ones and countrymen who are going through this difficult time with such grace and dignity. It is an example that the world would do well to follow closely and learn from. TR @oswaldopaya Norway we are with you. Terror will not kill your faith in liberty and peace. Christian Liberation Movement. 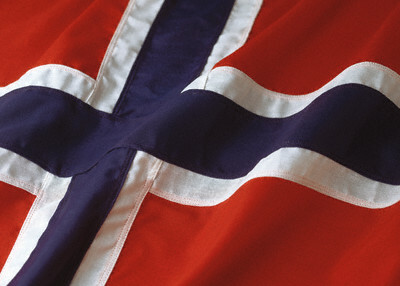 TR @yoanisanchez Very Sad what occurred today in Norway. In one minute life changes, ends, its taken away from you. Thought today's blog entry would be about services planned for Archbishop Emeritus Pedro Meurice Estiu who died yesterday or about Argentine filmmaker Marcos Carnevale's film Anita about the July 18, 1994 terrorist attack on a Jewish community center in Buenos Aires as seen through the eyes of a young Jewish woman with Down syndrome screening at the Cosford Cinema on July 29. Instead reflecting on Norway and praying for the good people of Oslo and Utøya. Horrified at the rising death toll and the evil behind it. Tonight at the Pedro Luis Boitel Award ceremony in Miami to honor former prisoner of conscience Librado Linares took the stage to introduce a retired Czech diplomat and first reminded the audience of over a hundred Cubans of the terrorists attacks in Norway. Reminded them of the solidarity demonstrated by Norwegian parliamentarians, who represent the people of Norway, in organizing a committee for the freedom of Cuban political prisoners and named it after Normando Hernandez (who was present in the room). Everyone to stand up and a moment of silence was held for the victims of the terrorist attacks in Norway. Remembering the first time I stepped foot in Norway was back in 1990 with a back pack and a Eurail pass traveling through Europe and trying to meet with Norwegian friends in the south of the country. The times over the years visiting different parts of Norway. Many times walking around downtown Oslo visiting the parliament building and the nearby pubs and restaurants. The political demonstrations, live music, gardens and all the sounds of Oslo and its people. How full that area of the city becomes on a late Friday afternoon and evening in the summer. Thinking of all this then outraged and resolved to denounce the evil behind the premeditated murders of innocent people to make some sort of statement or simply terrorize. Then remembered three concrete ideas from across the ages that seem to apply now. 1. Edmund Burke's simple yet profound observation that "When bad men combine, the good must associate; else they will fall one by one, an unpitied sacrifice in a contemptible struggle." 3. Finally from the last century Mohandas Gandhi's council to have optimism in the battle against evil saying that "When I despair I remember that all through history there have been tyrants and murderers and for a time they seem invincible but in the end they always fall. Think of it always." Have no idea whether the terrorist(s) behind the attacks today in Norway (is) are international or home grown but that does not matter his (or their) actions were and are evil and must be denounced. It also means that people of good will from around the world need to join together in preserving freedom and obtaining justice for the victims of today's horrid attacks. In the mean time will continue to pray for the injured, the dead and the families of those affected by today's events in Oslo and Utøya. Tomorrow and in the days to come see what can be done to confront the evil behind these acts. Martin Luther King Jr. was right we are caught in an inescapable network of mutuality. What happens on the other side of the world can profoundly impact for good or ill. In the future plan to return to Norway and walk through the streets of downtown Oslo once again and order a round of extremely over priced beers for my friends there. [ Videos above have music by Norwegian composers and musicians.] Seems an appropriate time to introduce some of my non-Norwegian friends to some of their works of music. The full text of his speech in the original Spanish is reproduced below. Texto leído por el arzobispo de Santiago de Cuba Pedro Meurice Estiu en la Plaza Antonio Maceo, durante la misa de Su Santidad el 24 de enero de 1998. En nombre de la Arquidiócesis de Santiago de Cuba y de todos los hombres de buena voluntad de estas provincias orientales le doy la más cordial bienvenida. Esta es una tierra indómita y hospitalaria, cuna de libertad y hogar corazón abierto. Lo recibimos como a un Padre en esta tierra que custodia, con entrañas dignidad y raíces de cubanía, la campana de La Demajagua y la bendita imagen de la Virgen de la Caridad de El Cobre. El calor de Oriente, el alma indomable de Santiago y el amor filial de los católicos de esta diócesis primada proclaman: ¡Bendito el que viene en nombre del Señor! Quiero presentarle, Santo Padre, a este pueblo que me ha sido confiado. Quiero que Su Santidad conozca nuestros logros en educación, salud, deportes…, nuestras grandes potencialidades y virtudes…, y los anhelos y las angustias de esta porción del pueblo cubano. Santidad: este es un pueblo noble y es también un pueblo que sufre. Este es un pueblo que tiene la riqueza de la alegría y la pobreza material que lo entristece y agobia casi hasta no dejarlo ver más allá de la inmediata subsistencia. Este es un pueblo que tiene vocación de universalidad y es hacedor de puentes de vecindad y afecto, pero cada vez está más bloqueado por intereses foráneos y padece una cultura del egoísmo debido a la dura crisis económica y moral que sufrimos. Nuestro pueblo es respetuoso de la autoridad y le gusta el orden, pero necesita aprender a desmitificar los falsos mesianismos. Este es un pueblo que ha luchado largos siglos por la justicia social y ahora se encuentra, al final de una de esas etapas, buscando otra vez, cómo superar las desigualdades y la falta de participación. 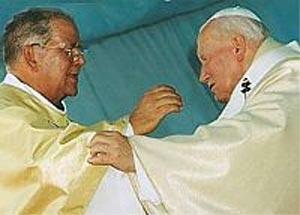 Santo Padre: Cuba es un pueblo que tiene una entrañable vocación a la solidaridad, pero a lo largo de su historia, ha visto desarticulados o encallados los espacios de asociación y participación de la sociedad civil, de modo que le presento el alma de una nación que anhela reconstruir la fraternidad a base de libertad y solidaridad. Quiero que sepa, Beatísimo Padre, que toda Cuba ha aprendido a mirar en la pequeñez de la imagen de este Virgen bendita, que será coronada hoy por su Santidad, que la grandeza no está en las dimensiones de las cosas y las estructuras sino en la estatura moral del espíritu humano. Deseo presentar en esta eucaristía a todos aquellos cubanos y santiagueros que no encuentran sentido a sus vidas, que no han podido optar y desarrollar un proyecto de vida por causa de un camino de despersonalización que es fruto del paternalismo. Le presento, además, a un número creciente de cubanos que han confundido la Patria con un partido, la nación con el proceso histórico que hemos vivido en las últimas décadas, y la cultura con una ideología. Son cubanos que al rechazar todo de una vez, sin discernir, se sienten desarraigados, rechazan lo de aquí y sobrevaloran todo lo extranjero. Algunos consideran esta como una de las causas más profundas del exilio interno y externo. Santo Padre, durante años este pueblo ha defendido la soberanía de sus fronteras geográficas con verdadera dignidad, pero hemos olvidado un tanto que esa independencia debe brotar de una soberanía de la persona humana que sostiene desde abajo todo proyecto como nación. 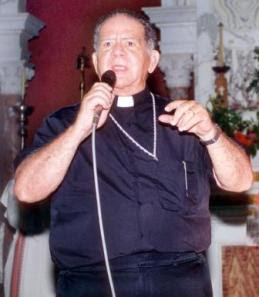 Le presentamos la época gloriosa del P. Varela, del Seminario San Carlos en La Habana y de San Antonio María Claret en Santiago, pero también los años oscuros en que, por el desgobierno del patronato, la iglesia fue diezmada a principios del siglo XIX y así atravesó el umbral de esta centuria tratando de recuperarse hasta que, en la década del cincuenta, encontró su máximo esplendor y cubanía. Luego, fruto de la confrontación ideológica con el marxismo leninismo, estatalmente inducido, volvió a ser empobrecida de medios y agentes de pastoral, pero no de emociones del Espíritu como fue el Encuentro Nacional Eclesial Cubano. Su Santidad encuentra a esta Iglesia en una etapa de franco crecimiento y de sufrida credibilidad que brota de la cruz vivida y comparada. Algunos quizá puedan confundir este despertar religioso con un culto pietista o con una falsa paz interior que escapa del compromiso. Hay otra realidad que debo presentarle. La nación vive aquí y vive en 1a diáspora. El cubano sufre, vive y espera aquí y también sufre, vive y espera allá fuera. Somos un único pueblo que, navegando a trancos sobre todos los mares, seguimos buscando la unidad que no será nunca fruto de 1a uniformidad, sino de un alma común y compartida a partir de la diversidad. Por esos mares vino también esta Virgen, mestiza como nuestro pueblo .Ella es la esperanza de todos los cubanos. Ella es la Madre cuyo manto tiene cobija para todos los cubanos sin distinción de raza, credo, opción política lugar donde viva. 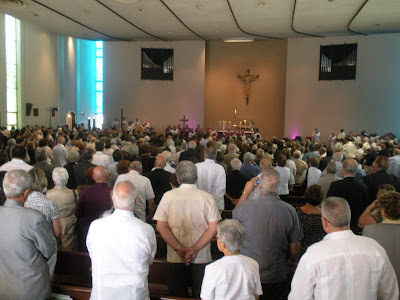 La Iglesia en América Latina hizo en Puebla la opción por los pobres, y lo más pobres entre nosotros son aquellos que no tienen el don preciado de la libertad. Ore, Santidad, por los enfermos, por los presos, por los ancianos por los niños. "Y tu Nombre será nuestro escudo, nuestro amparo tus gracias serán". Rotilla: Why did the Cuban regime kidnap a music festival? "Estaban Lazo, together with the Minister of Culture in the person of the vice-minister Fernando Rojas, seek to kidnap the event from the founders and organizers and carry it out through state institutions seizing and plagiarizing this our name, the days selected and our convoking of the festival." The Rotilla Festival bills itself as an event that "mostly seeks to promote the development of electronic music and vanguard art on the island of Cuba." Its concept is a beach party surrounded by nature and is celebrated during August over the course of three days and nights. The organization and logistics of the festival have been carried in an independent manner not linked to any official institutions. Entrance is free and the festival is non-profit only seeking artistic and civic values in the country. Its been described as a Cuban version of Woodstock. The festival has been around for more than a decade. It even has an online presence which is extremely difficult to come by in Cuba. It started in 1998 in Havana province in Santa Cruz del Norte and has grown steadily until now. A clue as to why regime officials would want to take over the festival can be found in the mini documentary "Free Air" by Sandra Cordero which was filmed, apparently at Jibacoa beach in Cuba between August 6-8, 2010. Estaban Lazo at 67 years old makes him one of the younger leaders of an extremely old regime that distrusts youth. The bottom line is the geriatric dictatorship in Cuba fears freedom. It fears young people organizing themselves and having a good time with music, film, art and culture. In 1969 in the United States the hippies attended three days of music at Wood Stock and they had a slogan: Don't trust anyone over 30. In Cuba today it appears that the Cuban dictatorship has its own slogan: Don't trust anyone under 65. Dr. Oscar Elias Biscet born fifty years ago today on July 20, 1961. 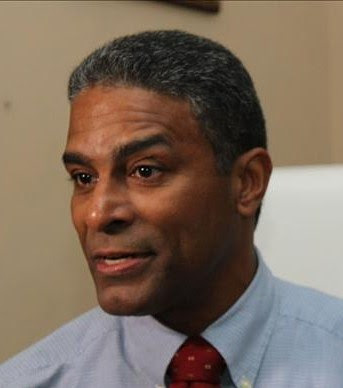 He is a medical doctor by profession and Cuba's disciple of nonviolent resistance following in the path pioneered by Mohandas Gandhi in India and later followed by Martin Luther King Jr. in the United States by vocation. "Now I would like you to do something we've never done before. A beautiful man, a doctor who has spent his time in the prisons of Cuba. He is also released. His name is Dr. Biscet. I want you to hold him up. Let everyone in Cuba know that he is special to us and we are watching WE ARE WATCHING. Hold him in your thoughts. Hold him in your prayers." And these compliments, although they fill me with emotion, do not affect my psyche, because I am convinced that his goal is to save my people from the Castro-communist dictatorship. I accept them, not as a personal praise but as a tribute to my heroic Cuban people. He has been a prisoner of conscience twice. He was arbitrarily detained on November 3, 1999 after holding a press conference and recognized by Amnesty International as a prisoner of conscience. He was released from prison on October 31, 2002 only to be rearrested again on December 6, 2002 while meeting at a home to discuss human rights. In March of 2003 he was sentenced to 25 years in prison and again he was recognized by Amnesty as a prisoner of conscience. He was finally freed on March 11, 2011. This is his first birthday not spent in a prison cell since 1999. Now thats even more reason to celebrate this his 50th birthday in freedom in Cuba not in exile. Aung San Suu Kyi after years as an Amnesty International prisoner of conscience in Burma was today able to honor her father's memory during Martyr's Day. Aung San was one of the Burmese leaders who achieved independence from Great Britain but were gunned down by a rival faction on July 19, 1947 just as the country was granted independence from Britain. 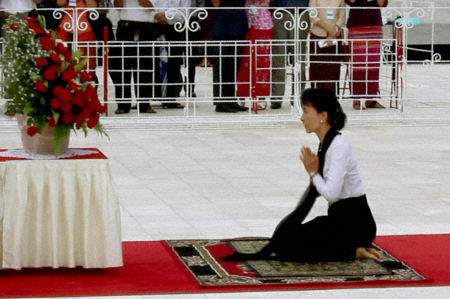 Aung San Suu Kyi leads hundreds of supporters in memorials for her father. Burma's pro-democracy leader Aung San Suu Kyi led a march of 3,000 supporters on Tuesday, July 19, 2011 in honor of her late father. She then spoke a private gathering. Voice of America reported that "following the afternoon march, the National League for Democracy issued a statement urging the government to hold a meaningful dialogue with opposition groups and to release all political prisoners. " After several years of house arrest, it was the first time in nine years that the 66-year-old Nobel Peace Laureate was able to take part in the Martyrs' Day commemoration at the Yangon mausoleum where her father's tomb is kept. Reuters news also offered a report of Martyr's Day. 85 people were murdered and 300 hundred wounded. 17 years later those responsible for this act of terrorism remain at large. A movement to remember the victims of this horrendous crime has organized both to remember and demand justice. Thanks to the youtube account of http://www.youtube.com/user/85vidasmenos have been able to post video clips of the movie "18-J" and public announcements to denounce this crime and remember those who lost their lives and hear from their loved ones. As the years have passed the acts of remembrance continue not only in Argentina but around the world. 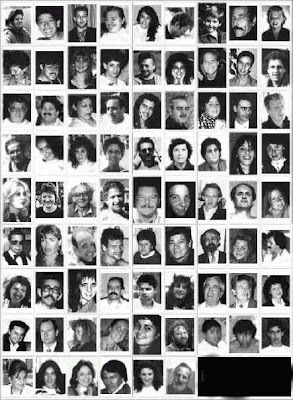 It was on the morning of July 18, 1994, that a car, filled with explosives, bombed the AMIA Jewish Community Center in Buenos Aires. The explosion left 85 dead and 300 others wounded. 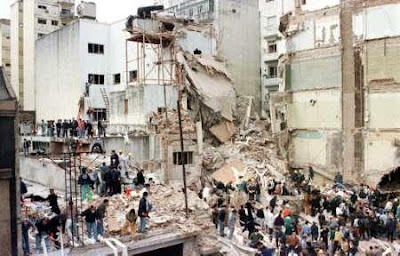 It was the deadliest terrorist attack ever in Argentina's history and happened only two years after the 1992 bombing of the Israeli embassy in Buenos Aires. 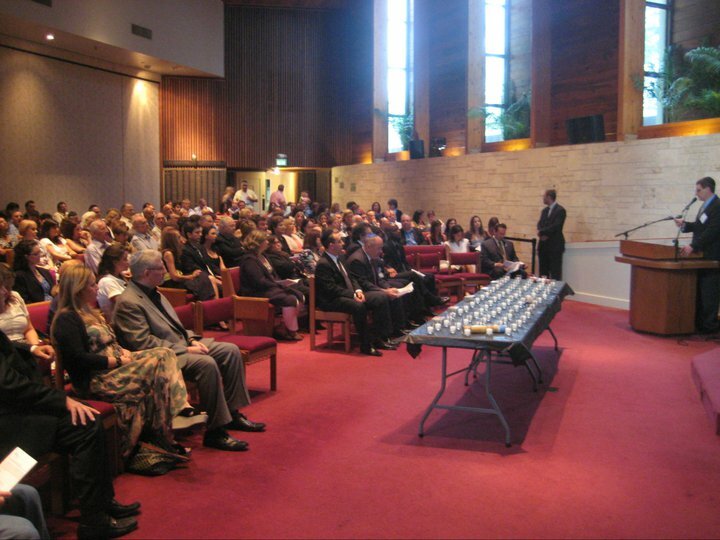 On Monday, the victims of the attack will be remembered and honored at a memorial service at 7 p.m. at Temple Sinai, 18801 NE 22nd Ave. in North Miami Beach. The speakers will include: Ofer Bavly, consul general of Israel; Miguel Talento, consul general of Argentina, and Juan M. Dircie associate director of the American Jewish Committee's Latino and Latin American Institute-Miami. There will also be a special screening of scenes from the movie "18-J," a collection of short personal and communal stories of victims of the attack. In addition in 2011 Argentine filmmaker Marcos Carnevale released the film Anita about the July 18, 1994 terrorist attack. Carnevale tell this story through the eyes of a young Jewish woman with Down syndrome named Anita. The film is now being shown in Miami at the Tower Theater and will be shown at the Cosford Cinema on July 29. This horrid crime took place just five days after another act of terrorism against 37 innocents trying to flee to freedom from Cuba. Shocked by another brutal act so soon afterwards in our Latin America. 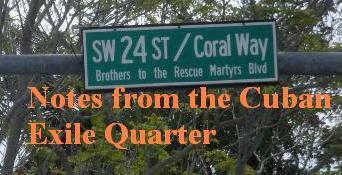 Living in Miami, Florida with both large Cuban and Jewish communities the reverberations of both these crimes were and continue to be deeply felt. 17 years have passed since both crimes took place and in both cases justice has proven elusive nevertheless acts of remembrance continue as do demands for justice. In Latin America in places like Venezuela anti-semitism is on the rise and it needs to be denounced. Sadly, fears exist that President Kirchner's relationship with Chavez may be part of the reason behind her collaboration with the Iranians. This despite the fact that Argentines have long suspected that high-level Iranian diplomats were involved in the July 18 attack. In Cuba, July 13, 2011. We work and struggle with love for Cuba and hope in the capabilities, value and goodwill of all Cubans, without classifying and dividing them by their ideas, beliefs, race or political positions, we are all Cuban and we are all brothers. And everyone, without exception, living in or out of Cuba, we will now be protagonists of the changes to freedom and peace here in this beautiful land that God gave us all as Country and Home. It only corresponds to us Cubans to define and decide on the changes our society needs and fulfill our national project. But for citizens to be able to truly design, decide and build their future, they must be guaranteed by law their rights and an environment of trust and respect for all achieved In this way we can make a genuine national dialogue and begin the process of legal changes without exceptions, for the people to keep everything positive that they have created and change exercising their sovereignty what they decide to change. 1. Changes in the laws that guarantee freedom of speech, press, association and religion, the right of Cubans to settle in any part of our country where they prefer to live, the right of Cubans to freely leave and enter Cuba freely, the right of all Cubans to have business and private enterprise in our country, all workers' rights, the right of Cubans to elect and be elected to public office by a new electoral law, the end to all discrimination against Cubans in their own country and the release of all those jailed for political reasons. 2. Achieving spaces that open participation with these changes in law and practice in respect of the rights of citizens, to convene a national dialogue and free elections for all offices and for a Constituent Assembly. 3. All Cubans without exclusions, without hatred, or vengeance, to make this transition in the way of truth and with transparency, reconciliation, liberty, solidarity, fraternity and peace, building a more humane and more just society in our sovereign and independent Homeland. Create a national commission composed of members of the government and the democratic opposition and other components of civil society, including representatives of trade unions, churches and fraternities, which guarantees the right to access, with equal opportunities, to diffusion in the mass media, of all Cubans individually, of their opinions and ideas, political and civic groups, churches, fraternities, social organizations and citizen groups. Free Internet access for all citizens and to foreign and national information by all technological means. Members of the Cuban democratic movement propose this transition path demand space in the mass media, which costs are shouldered by the people of which we form a part, to present our proposals, ideas and criticisms that the people can judge for themselves and the right of all Cubans to establish private and social broadcasting media. Decriminalization of opinion. Changes in the Criminal Code and other laws that guarantee freedom of expression and other rights. Ban all the mechanisms of surveillance, classification and repression against citizens. Facilities, spaces, and respectful environment for students, workers, neighbors, farmers and other groups can meet and organize democratically. Legalization of civic movements, political parties, human rights organizations and all associations of citizens who request it legally. Promote a new Law of Associations to ensure this right without any ambiguity. Removal of all restrictions on Cubans right to travel freely and end the requirement for "exit permit" for all citizens, including doctors, professionals, artists, technicians and the religious. End of confiscating property to those that emigrate and of the restrictions and need for permits for Cubans living abroad to be able to enter their country. End of the category of "final exit" and of charging in foreign currency documents of all kinds. Recognition of all citizens’ rights to all Cubans, living inside or outside of Cuba. Every Cuban is entitled to continue living in their home and no one can evict them, or strip them or deprive them of property or legally dwelling on their property, nor claim any compensation on account of being their former owner. Removal of all restrictions on Cubans to travel within the national territory or settle in a different province to that in which they reside. Prohibition of persecution, abuse, humiliation and deportation to citizens exercising this right. New electoral law that guarantees the exercise of popular sovereignty, so that all voters can be nominated for all elective offices, directly by citizens without candidacy commissions, so they can freely and democratically elect their representatives for each position. Creating a new National Electoral Commission composed of citizens proposed by the government, the democratic opposition and other members of civil society. That the rights to free health care and education for all Cubans remain guaranteed, but without political and ideological conditions. We demand fair wages and pensions, and prices commensurate with wages to reduce and eliminate the enormous difference between these and prices. Cubans live sentenced to poverty with no chance to overcome it. Low wages, restrictions of all kinds, prices and disproportionate taxes covertly hidden in dual currency and the poverty suffered by the people, makes it really the people who subsidize the government, its inefficiency and its privileged and not government that subsidizes the people. This abuse must be overcome immediately. To avoid corruption, the so-called piñatas, privileges, abuse and benefit of those who hold positions of economic and political power, the exclusion of the majority of the poor and uninformed and increasing the already large economic differences and to begin a new stage Building sustainable and integrated development, deeper economic changes should be made only under the control of citizens through democratic institutions. 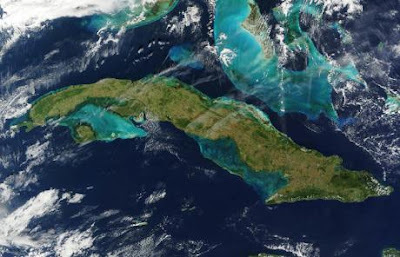 Cuba's natural resources, the work of its citizens, all that the people have created with love and effort throughout its history should not be, either privatized or subjected to investors, or sold or traded without the consent of people. But there can be no consent if there is not even knowledge, or mechanisms of citizen control, nor for the people to decide for itself. Thus the profound changes that generate justice and equality for the benefit of all Cubans, of the integral development of the ecological health of the national independence, social justice and raising the quality of life for all must be realized once the Cubans have in the law all the rights and free elections so that a sovereign people, who knows best and judges for his own sake, to discuss, review and decide on their national economic project. Cuba can not be auctioned or distributed as a cake. Cuba is home and source of wealth for all Cubans. The right to free employment of workers and respect for their rights and eliminating companies that rent the Cuban labor force to foreign companies and retain much of the earnings that belong to the workers. Laws should ensure for all Cubans the right to establish their own enterprises and private businesses and to hire workers respecting all their rights. We draw the attention of all governments, unions of states, international organizations, employers, churches and individuals so that any dialogue, negotiation and agreement with the Cuban government be carried out with transparency and never behind the backs of the people nor without dialogue with the Cuban democratic opposition and other sectors of civil society, if they want to cooperate with peaceful change and not encourage exclusions and injustices that will only bring more pain to Cuba. The conduct of a plebiscite for the sovereign people to decide on changes. The call for changes in laws and all projects and peaceful initiatives which are designed to achieve democracy, human rights, freedom, reconciliation and popular sovereignty. The participation of citizens in this path of change through the demanding of their rights and the dialogue that is respectful of diversity. Among those of us who peacefully struggle for democracy in Cuba there is wide diversity and richness of ideas and projects. This document contains our common ground, our position and common determination to defend the most legitimate interests of the Cuban people and their rights. Governments, institutions and peoples of the Americas, Europe and the world, if they want to support the Cuban people respecting their right to self determination, support and take as a reference this common base of the Cuban democratic movement. If we are together in anything it is in love for Cuba and the objective of achieving all rights for all Cubans, liberty, reconciliation, peace and true democracy for the people to exercise their sovereignty and choose their projects, the changes and their future. The Cubans have a right to their rights. Lets make the path of the people. Original document in Spanish here. 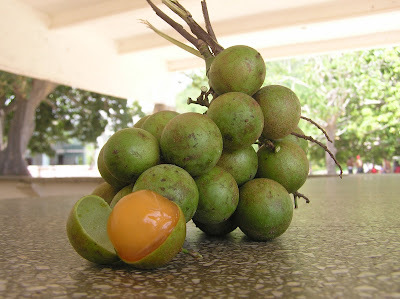 The mamoncillo (pictured above) is one of the minor fruits of the family Sapindaceae and found growing throughout the West Indies including Cuba. TR @ivanlibre Retired MININT Lt. Colonel Amado Interiano killed with one shot yesterday in the afternoon the adolescent Angel Izquierdo Medina of 14 years of age. Tonight came across a series of disturbing twitter posts from Laritza Diversent,a young attorney who lives in Havana, who since 2007 also writes as an independent journalist and has a blog Jurisconsulto de Cuba that is also translated into English as Laritza's Laws & Cuban Legal Advisor. It was so disturbing that it prompted this blog entry and her tweets have been translated and reproduced below. TR @jurisconsultocu I'm at the wake of Angel Izquierdo Medina, age 14, killed by one shot from an ex-police official. TR @jurisconsultocu Ex-police official kills a 14 year old adolescent for stealing some mamoncillos. Angel Izquierdo Medina, a 14-year old child was shot and killed by Amado Interian, a retired Lieutenant Colonel from State Security, in Mantilla, Cuba because he stole some mamoncillos. This evening because 400 friends, family members and neighbors decided to attend the dead child's wake and are upset about the circumstances surrounding his death were subjected to Cuban state security agents laying siege at the dead child's wake. The reaction by the regime's security forces no longer makes this a simple indictment of one retired state security agent but of an unjust system with a total disregard for human life. In a normal society it would be Amado Interian in custody and under investigation for the use of excessive force and the murder of a minor. It was only this past Wednesday that the 17th anniversary of the July 13, 1994 "13 de Marzo" tugboat massacre in which 37 men, women and children were extra-judicially executed by agents of the Cuban government who until now have not had to answer for this crime before a court of law. On the same day when Cubans were remembering this crime a 23 year old Cuban, Adonis Guerrero Barrios, was found dead, frozen to death, in the undercarriage of an Iberia jet that had arrived in Spain from Cuba. A heart breaking week for Cuban mothers and fathers mourning their children. How much longer will this unjust system continue? An interesting moment during the U2 concert at the Sun Life stadium, in Florida, were the words of the rock star and humanitarian activist Bono. With them he has made the world have a more transparent vision of the state of neo-slavery the beleaguered Cuban people are living in. The Irish singer Paul Hewson made a call for freedom for the Cuban people to recognize the humanistic work of a man whose essential purpose is the freedom of a nation. Bono offers concrete reasoning of the spirit of struggle of a human being, his principles, dignity, profession, pain, unjust imprisonment, worry, hope, faith, for the future of a people. Before a crowd of more than 73,000 people the poetic prose of the Irish man was defined by these moving words: "A beautiful man, a doctor who has spent his time in the prisons of Cuba. He is also released. His name is Dr. Biscet. I want you to hold him up. Let everyone in Cuba know that he is special to us and we are watching. WE ARE WATCHING. Hold him in your thoughts. Hold him in your prayers." And these compliments, although they fill me with emotion, do not affect my psyche, because I am convinced that his goal is to save my people from the Castro-communist dictatorship. I accept them, not as a personal praise but as a tribute to my heroic Cuban people. That is why I ask many other honored and famous personalities to follow the dignified attitude of Bono for my nation to soon enjoy full freedom and respect for human rights of each of her children. The Free spirit of Ireland manifested in Bono's gesture causes me to evoke the many Irish who died for the freedom of Cuba. As those five shot at Castle Atares in 1851, or the Liberation Army Colonel O'Hara, who wrote on the first flag raised in Cárdenas: Cuba: Primus in Cuba!, Or James J. O'Kelly New York Herald correspondent, who interviewed some of the nation's founding fathers in the free territory of Cuba and reported beautiful stories. While the famed rock singer honored me, the Castroites showed their resentment and cruelty preparing a plan to repress me. At police station Aguilera, Lawton, they manufactured a criminal record of control with my photograph and personal data. In an unsuccessful attempt to humiliate me they urged me to go to said headquarters to sign a document of control on the first five days of every month while the probation license is in effect. 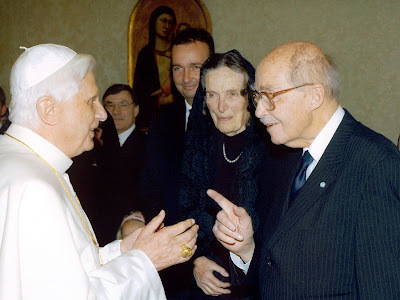 Categorically I tell these people blinded by hate and resentment that I'm not going to sign any document that restricts my freedom or violates the agreements signed in the church-state document that served as the basis for my release and my brothers of the Cause of the 75. For they, inspire me and encourage the rebellious spirit of Eire, the rebellious spirit of the Irish compatriots of the Liberation Army and the rebellious spirit of Bono, my distant friend in geography but close in the principles and struggle for human rights. I end with two phrases of love and hope, one from the celebrated Martin Luther Jr. and the other from he who writes you: "Here I stand; I cannot do otherwise, so help me God." And mine: "Freedom is only found when men with dignity search it out." God continue to bless your homes and your lives. "A Witness to the Changing Face of Europe"
VATICAN CITY, JULY 11, 2011 (Zenit.org).- Here is the text of the telegram sent Saturday by Benedict XVI on the occasion of the death of 98-year-old Otto von Habsburg, who was the eldest son of Charles I, the last Emperor of Austria and King of Hungary. Archduke Otto of Austria died July 4 in Pöcking, Germany, and his funeral is scheduled for July 16 in Vienna, Austria. The telegram was sent to his son, Karl von Habsburg, also known as Archduke Karl of Austria. Condolences can be expressed to the family at the following link. With deepest sympathy have I learned about the passing of your father, His Royal Highness Archduke Otto of Austria. In this hour of sadness at your painful loss, I am united with you and all the royal family in prayer for the dead. During his long and full life, Archduke Otto has been a witness to the changing face of Europe. 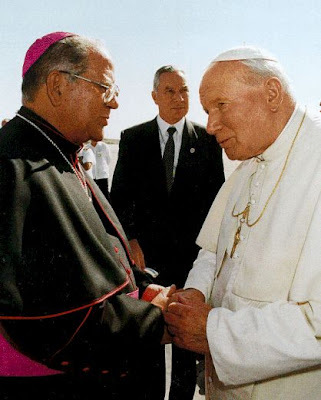 Trusting in God and aware of a significant heritage, he has been a committed European tirelessly working for freedom, for the unity of peoples and for a just order in this continent. May the Lord reward him for his diverse acts for the good of mankind and give him the fullness of life in his heavenly kingdom. Through the intercession of Mary, the mother of God, I offer an Apostolic Blessing to all family members and to all who mourn Archduke Otto, and who pray for his eternal salvation. Citizens Reasons: Chapter 7 "Racism in Cuba"